It’s been a whirlwind of work for hair stylist Lindsey Kaplan since she graduated from Paul Mitchell The School. She been styling the hair of the rich and famous as well as us ordinary folk and loving every minute. She has worked on the set of E! News, Heidi Klum’s Aol.on, Food Network, and The Doctors to name just a few. Now making house calls in the Los Angeles and Orange County areas, Lindsey Kaplan is ready to primp and pamper you in the comfort of your own home. Lindsey practices what she calls “Personalized Hair”. She customizes every color, every cut, and every style just for you. So if you're looking for consistent high quality results, you can be confident with Lindsey's experience, you're in the hands of an expert. The Keratin Hair Treatment is a revolutionary treatment that softens and smooths unruly hair. This treatment takes away the frizz and most importantly gives you straight, sleek hair naturally. The key ingredient is Keratin. 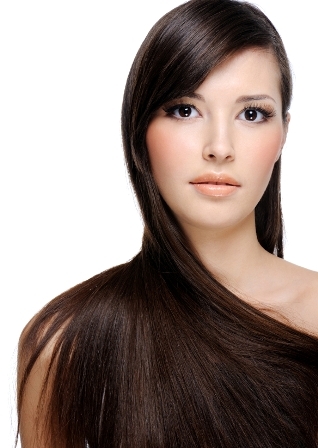 Keratin is the primary protein of the skin, hair and nails. It is said that Keratin comprises approximately 88% of your hair. This natural substance gives hair the ability to return to its original healthy, shiny, smooth and conditioned state. You don't have to be worried about committing to these treatments since keratin hair products leave the hair shiny, healthy and beautiful for 3-5 months. After this period your hair will be back to its original natural self. In fact it is designed to make the bonds of the hair stronger for a long period of time, your hair will appear even healthier than before. This treatment is great for all hair types and is extremely effective on chemically treated hair. Human hair extensions are the best and most natural looking way to change the look and feel of your hair. With human hair extensions, you are not locked into a particular color or style. The extensions can be washed, colored, and styled just like your natural hair. There's a wide variety of color and textures to match everyone's hair type. With expert selection, professional application, and conscientious care, human hair extensions are virtually indistinguishable from your own natural hair. Feel more confident. You will instantly feel sexier! Look younger. Hair extensions will present a healthier, younger more vibrant looking you. Add color without any damage to your hair. You can have those bright colors that won't fade. Cover any split ends. Extensions will help cover all your damaged ends and leave your hair looking healthy and fabulous! Add length. Extensions will instantly give you the long hair you've been wanting. Get up to 20" in just a few hours. Grow your natural hair. With extensions, you will have no problem with the in between faze. Add Volume. Adding extensions will pump up the volume and give your hair more movement. Boost your social life! Feel confident in the way you look. They are not permanent. They can be removed at anytime. I am conveniently located off the 101 and 405 freeways at Epic The Salon, a Paul Mitchell Signature Salon.